1. We had a wonderful thanksgiving in New York City. That is one beautiful city, with so much to do and so little time. It was especially nice to be there as the Christmas season was kicking off, seeing all the Christmas lights going up and getting only a mild taste of winter. A few snow flurries on Saturday morning while we were walking around the 9/11 Memorial were just enough to let us say we saw snow and not so much that it became nasty weather to walk through. 2. The Rockettes Christmas Spectacular at Radio City Music Hall was absolutely amazing. The music, dancing and singing were great, but the best part was the end. They presented the true Christmas story with as much passion, beauty and pageantry as you could imagine. It was the best presentation of the birth of Christ that I have ever seen. Live camels and sheep, Kings and shepherds bowing before the baby Jesus and “Hark the Herald Angels Sing” made it a great show of the true meaning of Christmas. If I’m ever there around Christmas again, I’m absolutely going to see the Rockettes! 3. Going in for my second knee surgery later this week, on Wednesday morning. The right knee is doing pretty well so far. I’ve played golf and walked NYC without much pain or any complications so I think everything is going to be good. The left knee is definitely ready because I can feel the difference between the two now. Ready to get this behind me. 4. The only potential downers to Thanksgiving Day were the football games. Can’t believe the way the Horns played and, unfortunately, the Cowboys played just as would be expected. 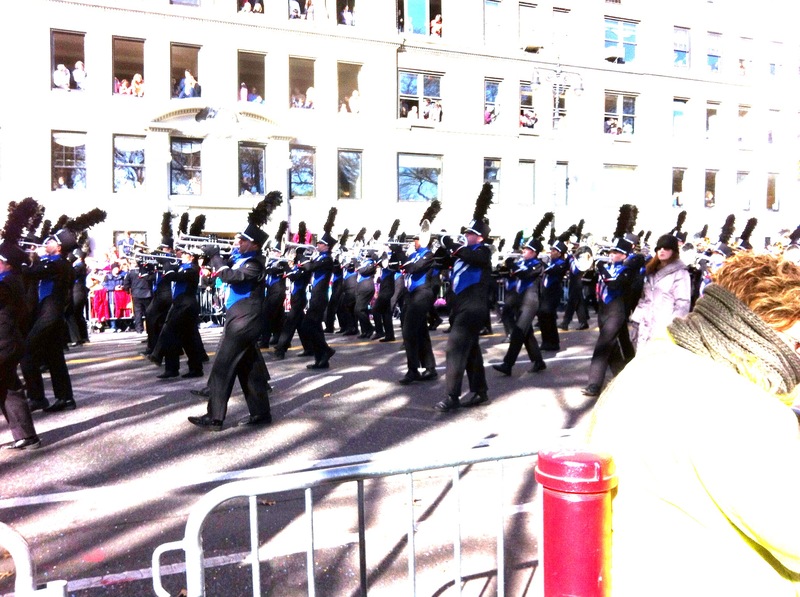 But even that couldn’t keep us from being excited about seeing the Oak Ridge Band march at Macy’s. We were in bleachers beside Central Park, between 70th and 71st streets, near the beginning of the parade route. It was amazing to see the floats, balloons and celebrities. But the highlight was without doubt watching the War Eagle Band strut their stuff down Central Park West. They were awesome and we were all so excited we could hardly contain ourselves. This entry was posted in Spring Creek BC by sbrazzel. Bookmark the permalink.